I’ve turned over a new leaf; when I’m in recipe creating mode I actually look to see what I already have tucked away in the fridge/kitchen cupboards and start from there. Sounds simple right? But, up until now, whenever I would think up a new recipe I’d run out to buy a whole host of ingredients – which means that over the years my husband has become increasingly concerned he married a mildly bonkers collector of every existing nut/lentil/grain/specialist flour…you get the drift. Quite frankly it’s getting hard to shut our kitchen cupboards. 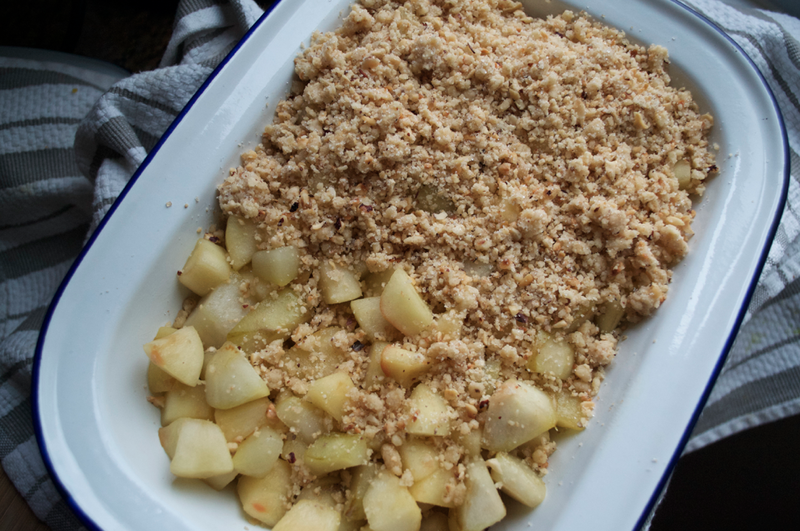 So, this week I’m making use of 3 bags of chopped, roasted hazelnuts I had lying around and have created a pear and apple crumble with a delicious nutty topping. Pop your oven on to warm up at 180°. Roughly peel and core the fruit then cut into 2-3cm cubes. Heat the butter in a large pan and pop in the diced fruit, sugar and vanilla seeds. To access the seeds carefully slice the vanilla pod in half lengthways and scrape the black seeds out with a knife. 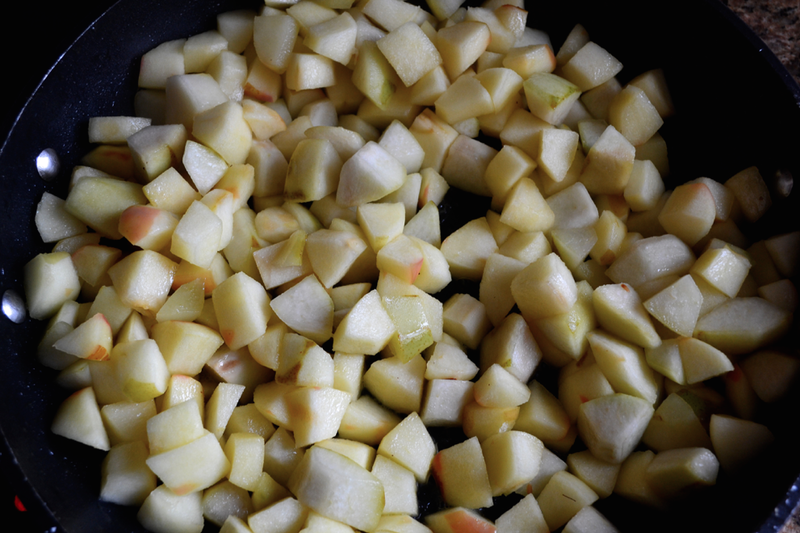 Cook over a medium heat until the fruit softens and starts to brown, around 15min. If you’re in a rush you can easily skip this step – I find it just adds a little more to the flavour. To make the crumble put the flour and butter in a large bowl and lightly rub together with your fingertips until it resembles breadcrumbs. Pop 75g of the hazelnuts into a food processor and blitz until they have a flour like consistency. 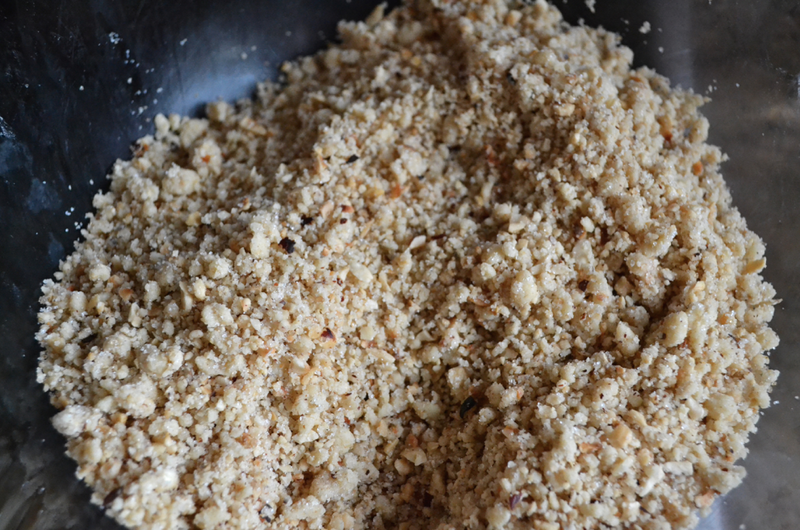 Add to the crumble mixture along with the rest of the hazelnuts and sugars. 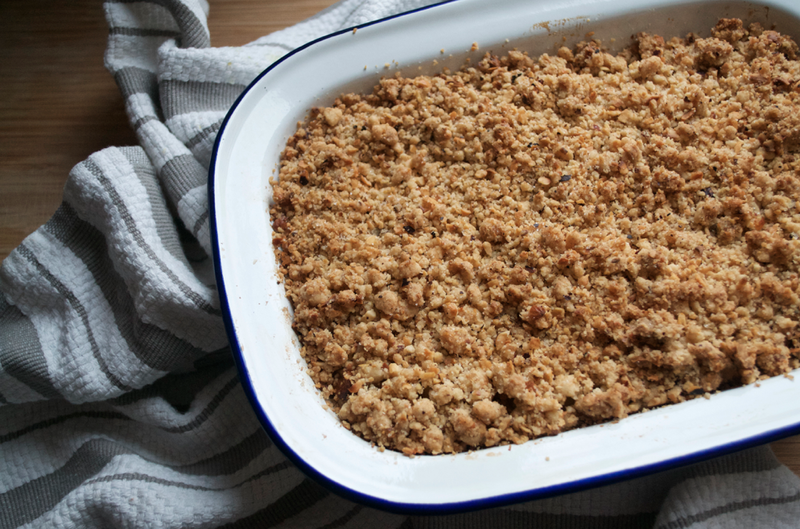 Pour the softened fruit into a baking dish and top with the crumble mixture. Bake for around 40-45 minutes. The hazelnut crumble topping seems to burn quite easily so make sure to keep a close eye on it and cover with foil after around 20min if necessary.